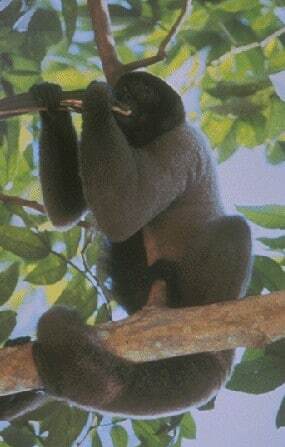 The Gray Woolly Monkey was first reported by E. Geoffroy in 1812. It inhabits both Brazil and Peru. This particular species is currently (2003) listed as vulnerable. It is also known as Geoffroy’s Woolly Monkey. They are frugivorous, feeding mainly on fruit, but have also been reported to feed on insects and leaves. They are gray in color, with a thick dense coat. Their face, hands and feet are black. The inside of their arms are also darker in colour. They have a large prehensile tail, this gives them the ability to maneuver aptly through trees. E-mail to add your Gray Woolly Monkey related website.